This is a good way to use up leftover chicken. In my case, I had tons of chicken from making Pho Ga (Vietnamese Chicken Noodle Soup) last week. 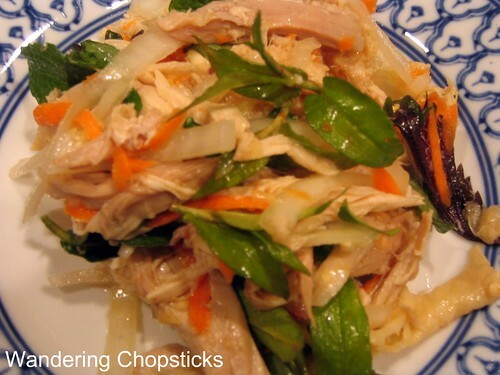 My family likes to eat this salad warm, often using some of the chicken when we make Hainanese chicken rice. It's a pretty simple salad, with just a little bit of rau ram (Vietnamese coriander) and Hanh Dam (Vietnamese Vinegared Onions) to round out the flavors. Prepare vinegared onions and set aside. Boil and shred chicken. Set aside. Pluck and clean herbs. Roughly chop and set aside. Prepare the Nuoc Mam Cham (Vietnamese Fish Dipping Sauce) by adding a few cloves of garlic, chili peppers, and a spoonful of sugar into a mortar. Mash into a paste. Then add fish sauce to taste. 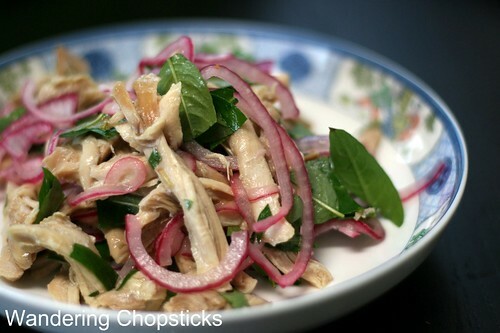 Combine all ingredients into a bowl -- the shredded chicken, herbs, vinegared onions, and dressing. Toss until all ingredients have combined evenly. Adjust vinegar, fish sauce, or sugar as needed. Add ground black pepper if you wish. Allow the salad to sit for about 15 minutes so the flavors can meld, but this Vietnamese chicken salad is best eaten while still warm. Salad may also be refrigerated for several hours before serving. In my family, we like to eat this warm, after the chicken is freshly cooked so obviously no refrigeration. When ready to serve, scoop salad out so that the excess juices may drain. You can eat this plain or serve with a side of rice or scoop up with shrimp chips. Alternatively, if you want more greens, you can make Goi Ga Bap Cai (Vietnamese Chicken Cabbage Salad). So why the update from my earlier recipe? Well, I think my directions are better, more clearer. And also, eek! Look at the original photo. Not nearly as appetizing, eh? I made this recipe tonight, with cabbage and a bunch of mint - it was delicious. Thanks a lot! I'm glad you liked the recipe! Hi WC! Thanks for the recipe ... can't wait to try this ... btw, I love your Pho Gai ... been making it a couple of times now ... still can't find any good Vietnamese Restaurants here. Prefer to make my own, especially with your recipes! Wait... you made pho ga? I thought you didn't like pho ga ;-) I love goi in just about any combination and yours (old photo and new photo) look delish. I think it must be the rau ram (that I can't seem to grow for anything). You've been making my pho ga all this time and haven't told me? You've been there for years and you still haven't found a good VNese restaurant? I don't, but I still made it for the blog. ;) I don't understand why you can't grow rau ram. It's so easy. Surely if you can do roses, you can do rau ram!